The group’s upcoming album project, 'Hidden in Plain Sight,' will be released on September 23. Cameras flashed. Hands clapped to the melody. And someone with a YouTube account recorded and uploaded the whole thing. Currently, the video has more than five million views worldwide. They (Roger and Warren Thomas, Rod Eldridge, Napoleon “Polo” Cummings, Dwight Stewart, Garfield Buckley, and Armand “Hops” Hutton) call themselves Naturally 7. From New Edition to N’Sync, the music industry has seen its fair share of male and female singing groups. If you listen closely, there’s normally one talented member in each band—the others tend to be average or plain run of the mill. However, this doesn’t apply to Naturally 7—they perform as a single, harmony-filled unit. “When we’re hitting the high notes, we don’t want people to think a female is doing it,” explained Roger, founding member and musical director of the group. “It’s an all male band. We want them to know that it’s just us guys hitting the notes,” he added with a laugh. Able to mimic an entire orchestra, Naturally 7 entertains audiences across the world by using one of the human body’s most precious instruments. The original members came together in New York in 1999, and released their first album the very next year. Roger teamed up with his brother, Warren, and five other talented singers they had come to know over the years from singing around the city. Having been in and out of several traditional male groups, Roger developed an affinity for a cappella sounds and a unique ability to create distinct harmony arrangements. The other members found unique aspects of their own voices to use as instruments during performances. After winning several amateur singing competitions in New York and across the nation, Naturally 7 went on to release “Non Fiction” followed by five more albums, including 2006’s “Ready II Fly.” This project opened at number 14 on the Australian ARIA Charts and it peaked at number 67 in France. The group’s upcoming album project – “Hidden in Plain Sight” – which just happens to be their seventh release – took two years to make and will finally be released on September 23. You can pre-order at the group’s label, Hidden Beach Recordings. Although they have achieved international fame, the group feels as though many people still don’t know who they are. With that in mind, they named their newest album Hidden in Plain Sight—an ode to being under the radar. In 15 years, Naturally 7 has had to replace only three members (Jamal Reed, Marcus Davis, and Andre Edwards). Those who were added to the fold had to meet one specific requirement, among others. Their phenomenal talent, coupled with a live show that many consider to be one of the best in the world, has Naturally 7 poised for a brilliant future. 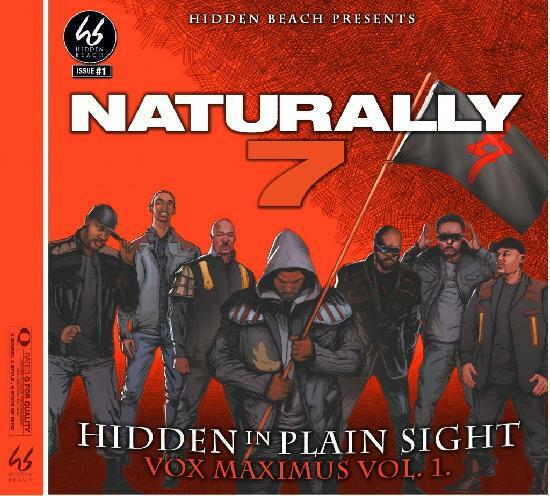 As 2014 unfolds, they will have toured Europe, Australia, Canada and the U.S.
For MORE on Hidden Beach recording artists Naturally 7, and to pre-order “Hidden in Plain Sight,” click HERE.